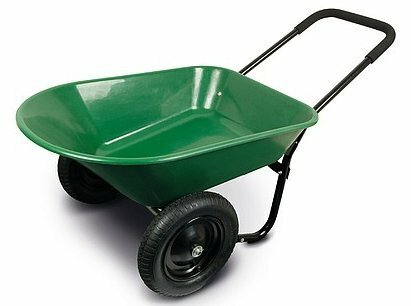 We've just bought a new 2-wheel wheel-barrow. We already own two which have done good service. The first one we inherited from Mum & Dad who bought it for their house in Dorset over 20 years ago. The second we bought from the same manufacturer not long after we moved in here. But you can always do with another barrow. On sunny weekends there are often three of us working on different projects in the garden and each needing a barrow. And unfortunately they don't last for ever and one of them needs a new tyre. So, last week when we visited the local Aldi in Coalville to buy a couple of rose arches they were advertising, we were pleased to see they had 2-wheeled barrows on offer at a very reasonable price. Seems crazy that gardeners use one-wheelers. They are handy for wheeling along narrow paths and wooden boards, but they are fiddly to balance and you need both hands. The two-wheelers, with pram handles, are easy to push or pull along with one hand and are always stable. You may still be able to get some from Aldi, although they tend to have "special purchases" and not keep them as a regular item - but you can get something very similar (if not identical) from Clifford James who sell via Amazon. I wrote about these a couple of years ago >> or click on the photo for more info.